My middle daughter Biba (the model) is bunny mad. It seems that everyone in this house collects something. With my eldest it was Star Wars - he is 18 now and only just growing out of it. I hadn't seen him for about three weeks and it was only after I threatened to sell his Lego Star Destroyer to the highest bidder on Facebook that he made an appearance. Next is Sonny (8), he is partial to an Owl - his interest was spurred on by the fact that his adopted grandpa has a real owl. Sonny then decided to start collecting. Car boot sales each week soon grew his collection - then I made the fatal mistake of seeing a stuffed Victorian owl in a shop on Carnaby Street a couple of weeks ago. Took a pic for him and three days later the thing had moved in! The little one, Betty (5) or Boo as she is known has a thing for pandas - or Bammys as she calls them. Anyone entering her room could be mistaken for thinking they had entered a Chinese rehab project! 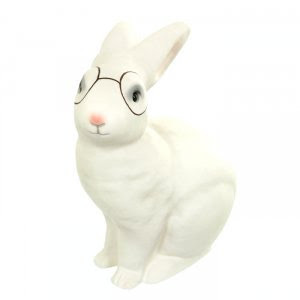 To be fair this Limited Edition Rabbit lamp is actually pretty cool. It uses a 15 watt bulb and gives off a soft comforting glow - perfect for any child's room. It has glasses handpainted on and a limited edition number on the base.